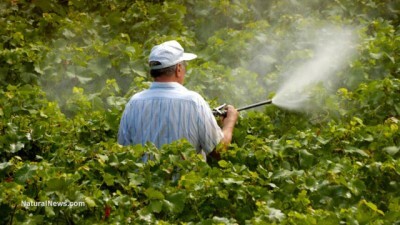 A single person’s exposure to pesticides may affect not just the person exposed but also three or more generations of their descendents, according to a study conducted by researchers from Washington State University and published in the journal PLOS ONE. The study looked at the effects of exposure to methoxychlor, a formerly widespread insecticide banned in the United States just over a decade ago. “What your great-grandmother was exposed to during pregnancy, like the pesticide methoxychlor, may promote a dramatic increase in your susceptibility to develop disease, and you will pass this on to your grandchildren in the absence of any continued exposures,” researcher Michael Skinner said. Methoxychlor, also marketed under the names Chemform, Methoxo, Metox and Moxie, was first introduced in 1948 but became even more popular after the banning of DDT in the 1970s. Closely related to DDT, it was widely promoted as a safer alternative and used to treat everything from agricultural crops and ornamental plants to livestock and pets. Research eventually revealed that, like DDT, methoxychlor is a persistent organic pollutant, meaning that it resists being broken down and therefore accumulates in the tissues of living creatures, persisting in the environment for long periods of time. The European Union banned it in 2002, and the United States followed suit in 2003 after studies showed that it was a neurotoxin at high doses and, even at low doses, an endocrine disruptor and estrogen mimicker that causes reproductive damage and infertility. The researchers exposed laboratory rats to methoxychlor at a dosage designed to approximate a high dose in human beings. They found that, in each succeeding generation up to the fourth (the great-grandchildren of the exposed rats), the risk of ovarian disease, adult onset kidney disease and obesity actually increased. While previous epigenetic effects have mostly been found in sperm, meaning that they can only be transmitted through the paternal line, methoxychlor was found to change the epigenetics of both sperm and egg cells. “If the sperm or the egg have an altered epigenetic signature that is being used to develop the early embryo, those signatures are transferred to the embryonic stem cell, which can turn into any cell in the body,” Skinner said. For example, an epigenetic change to adipose (fat) tissue could cause the body to store more fat in response to less food, increasing the risk of obesity. Skinner noted that the recent surge in obesity rates could be partially caused by pesticide exposure by our great grandparents. Methoxyclor is still used in Mexico and many South American countries, and may be found on imported produce sold in the United States. Prior research by Skinner and others has found epigenetic effects spanning up to six generations in a wide variety of chemicals including plastics, pesticides, dioxins, hydrocarbons such as petroleum, PCBs, DDT, bisphenol A (BPA) and even the popular insect-repellant chemical DEET. Not all the studies have been conducted on animals. A 2007 study found transgenerational effects in the descendants of people exposed to DDT.